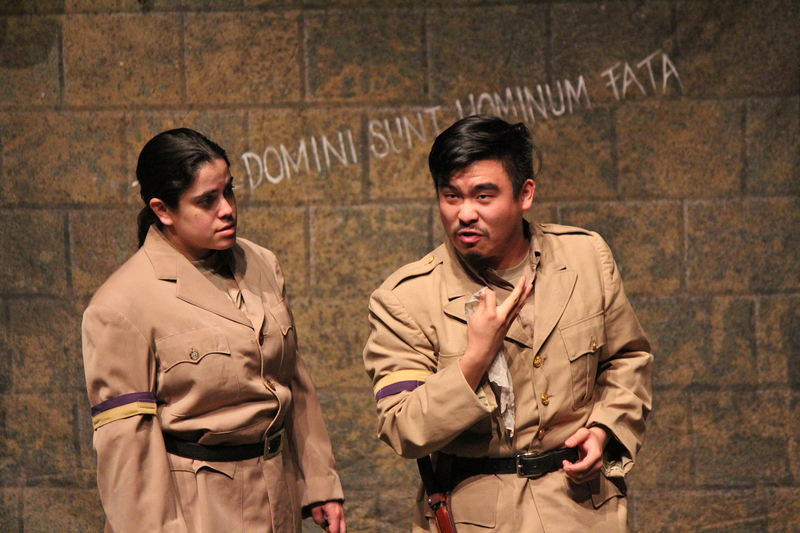 Melanie Marshall and Phil Wong in SF Shakes’ 2014 Tour of Julius Caesar. You see, we did it. We committed to 50% women and 50% actors of color in our Free Shakespeare in the Park cast of The Taming of the Shrew, and we did it. It certainly helped to have my integrity on the line – there’s nothing like being accountable to your community. But here’s the thing – it wasn’t hard. We recruited and read great actors of color for every role, and plenty of them were the best actors for the roles. There was no “compromising” – a word I hear whispered in fear by white directors whenever casting actors of color comes up. In a play where gender is a central theme, I considered both women and men in opposite-gender roles and thought about what that would mean to the gender dynamics of the play. I found that although I didn’t cast across gender in every role, because I felt it would undermine my own feminist take on the play, I still ended up with numerous roles cast across gender. Our audiences, already diverse, will see themselves reflected on stage this summer. But the last thing I should do is sit in my office patting myself on the back and sneering at folks still producing heavily white-male seasons. I believe we’re talking about the future of theatre here, and if one of us goes down, we all go down. So it’s up to all of us to help each other out with this stuff, because it’s tricky, and it can be sensitive, and we’ve all been brought up in a very racist and sexist system. We’re all going to make mistakes, because this stuff is very deeply ingrained, but we’ve all got to try harder to do better. Lisa Wolpe and Chastity Dotson in Hamlet at the LA Women’s Shakespeare Company. In January 2014, I had the opportunity to co-present a panel at the Shakespeare Theatre Association’s annual conference with Lisa Wolpe, founding artistic director of Los Angeles Women’s Shakespeare Company. Lisa has been casting critically- acclaimed all-female productions for decades. Her own portrayals of Iago, Hamlet, and Richard III are very nearly legendary. Lisa and I both wanted to show our audience of leaders from Shakespeare companies across the globe that casting non-traditionally is not only the right thing to do for our society, but artistically compelling. As I shared at the beginning of our presentation, casting is 90% of the work – actors on the stage are not just people but symbols. Audience members automatically look at the cast for signs of identification. Some of us, the white able-bodied folks, usually don’t have to look very hard. Our empathy doesn’t get much of a workout, because there’s usually someone up there our age, race, ability, and gender – someone who is easy for us to identify with. Women have to stretch further than men, usually, since men are still represented far more frequently on American stages. People of color can get so exhausted by constantly being asked to identify with those who not only don’t look like them, but have historically oppressed them, that they burn out completely and stop going to the theatre. As for people with disabilities, I’m amazed any of them go to the theatre at all. René Millán and Stephanie Beatriz in Measure for Measure at OSF. “Traditional” Casting. Or as I prefer to call it, “White-male default casting.” This is what you most often see on American stages and in American films. This type of casting is based on the assumption that a white male actor is “neutral” – that he can play anything. He doesn’t symbolize anything or carry a set of codes that refer to his social meaning. He’s the perfect blank slate. White-male default casting also assumes that everyone else – women, actors of color, actors with disabilities – are so full of meaning that just one thing about them completely defines them. A woman must represent all women, a Black man represents all black men, etc. For Shakespeare companies in particular, this type of casting is often justified by tradition – in Shakespeare’s time, white men did play all the roles. “Blind” Casting. I still hear the terms “gender-blind” and “color-blind” casting used on a regular basis. Here’s the thing – this kind of casting doesn’t really exist, unless the director and the audience really are all physically blind. Because actors are symbols, because we are all trained to see meaning in color, gender, age, and so on, no casting can be truly blind. I don’t care how open-minded and evolved you are as a director, even if you claim not to “see” color or gender, your audience sees it. Your casting choices affect how they see the play, for better or worse. “Non-traditional” Casting. Or as I prefer, “Intentional” Casting, or Casting for Justice. This type of casting acknowledges all the meaning present in every person. White men aren’t neutral, they’re just as coded with meaning as everyone else. Your deliberate choices resonate with your audience, and they resonate with different people differently. That means if you cast a black man as a servant or a young Asian woman as a prostitute, you have to acknowledge all the cultural baggage behind that choice. 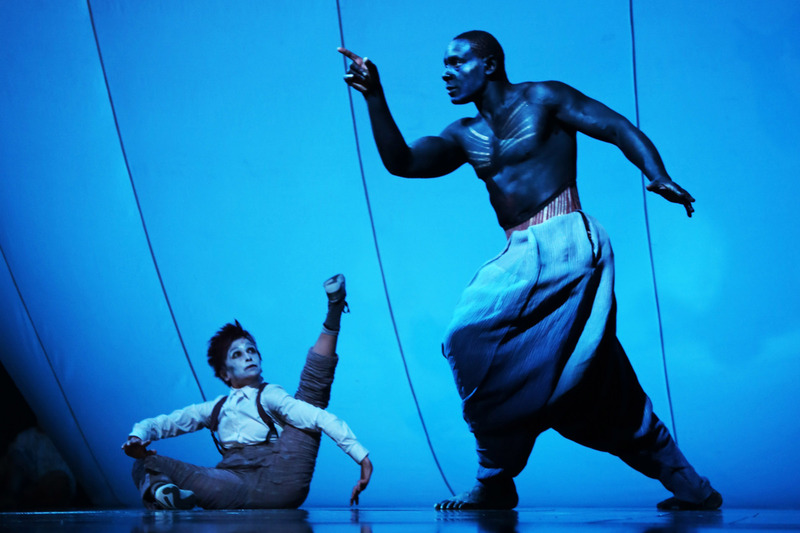 Kathryn Hunter and David Harewood in Taymor’s A Midsummer Night’s Dream. Casting the way things are: This type of casting highlights problems in our culture. An example: a recent production of Measure for Measure at Oregon Shakespeare Festival in which Isabella was a young Latina and the Duke was an older white man. The less empowered characters in the play were played by actors of color, pointing out the skewed power dynamics and lack of justice in the play. For plays in which race is central, like Othello, or modern plays such as M. Butterfly or Ruined, this type of casting makes a lot of sense. Casting the opposites: This type of casting includes cross-gender productions, or a production like Patrick Stewart’s Othello in which he was the only white man in the cast (playing the title role). It can serve to highlight problems in society or for comic effect (as when a man in drag plays Lady Bracknell in The Importance of Being Earnest). Most single-gender productions work a bit differently in that they invite us to deliberately find points of identification with the opposite gender or highlight themes that we might usually ignore. They also allow us the sheer enjoyment of virtuosity – appreciating a flexible actor in convincing drag. 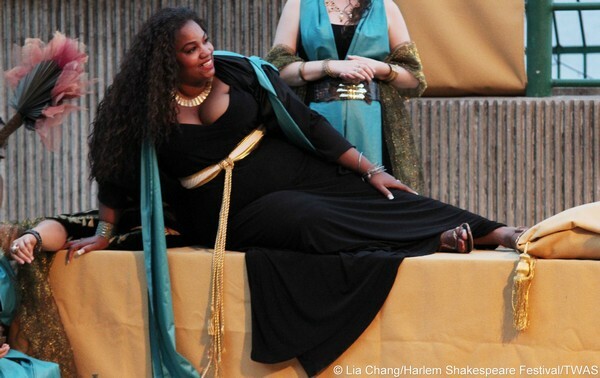 DebraAnn Byrd as Cleopatra at the Harlem Shakespeare Festival. 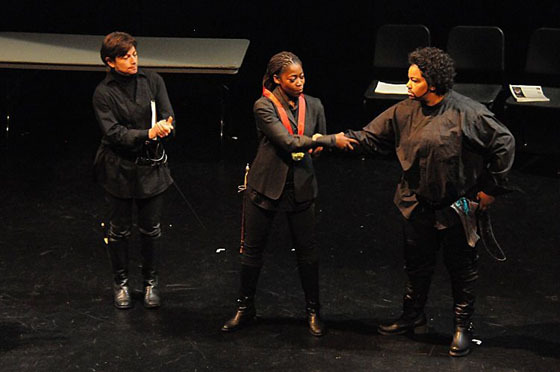 Last year, Lisa directed a reading of Othello at Harlem Shakespeare Festival, with their artistic director DebraAnn Byrd in the title role and herself as Iago, demonstrating this third type of Casting for Justice. As part of our presentation, DebraAnn and Lisa performed a scene from the play. 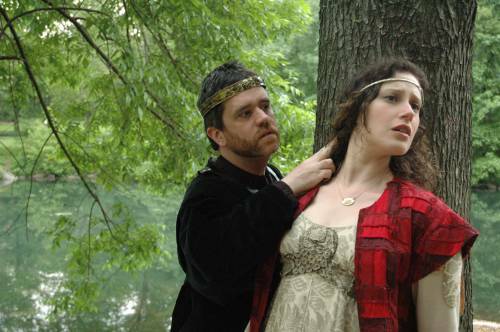 Lisa also directed two colleagues from New York Classical Theatre, Nick Salamone and Sean Hagerty, in a Desdemona/Emilia scene. Lisa Wolpe, Mary Hodges, and DebraAnn Byrd in Othello at the Harlem Shakespeare Festival. I found that watching two women playing hyper-masculine military men coping with sexual jealously brought new resonance to a familiar scene. My attention was drawn to gender-based expectations – the strength men must display according to our culture, their fear of vulnerability or sexual competition. “Performing masculinity,” when portrayed by women, is revealed as a false construct that anyone can put on. Sean Hagerty as Richard III, New York Classical Theatre. Perhaps because we’re used to thinking of men in drag as comic relief, the scene in which two men played women talking about their abuse at the hands of men had a particularly strong impact. (The line “These men, these men” rang through the room with piercing pain and irony.) Lisa side-coached the scene in a way that reminded the actors of their characters’ sexual history, experience of domestic violence, and solidarity in a masculine world. Sean, a bearded white actor in his forties who played Emilia, had never played a female character before. As he said afterwards, “Rather than limiting the play, casting across gender actually opens it up. It plays into the meta-theatricality inherent in the text and makes it somehow more relate-able, more experiential, so that they identify not with a character themselves but with the issues at hand. In that sense it’s almost Brechtian.” In other words, by using actors whose physical appearance signals something completely opposite from the characters, our minds expand, we become more open to new experiences – and we experience a more universal empathy. Nick Salomone as Dorn in The Seagull, New York Classical Theatre. Nick, who played Desdemona, is a white actor in his fifties, slender and balding. His emotionally raw performance left several audience members weeping. “As a gay man, I’ve worked so hard at appearing as masculine as possible. I’ve never allowed myself to be this vulnerable on stage. Desdemona let me into a side of myself I usually try to hide.” These white male actors, the usual beneficiaries of traditional casting, delved deeper and stretched further when cast non-traditionally. Casting for Justice isn’t just about fair and equitable treatment for women and actors of color, although that’s incredibly important. It’s about making the art form relevant for all of us. It’s about expanding all of our minds, freeing us all from the tyranny of received wisdom, and giving us new ways to see the world. Best of all, it’s about making what we see so unexpected that we have to listen instead. NOTE: This essay originally appeared at Works by Women SF, where Rebecca J. Ennals is a guest contributor. Casting for Justice is also about making awesome theater.